How did the Universe cool over time? Authors: I. Martino et al. While numerous cosmological models have been proposed to describe the early history and evolution of the Universe, the Big Bang model is by far in the best agreement with current observations. Different cosmological models predict different behaviors for the temperature evolution of the cosmic microwave background over time, and the Big Bang model predicts that the CMB should cool adiabatically via expansion (i.e. without any the addition or removal of any heat). We can describe the “overall” temperature of the Universe by measuring the blackbody spectrum of the cosmic microwave background, as it is believed that the early Universe was in thermal equlibrium (i.e. same temperature) as these CMB photons. By measuring the CMB temperature evolution over a range of redshifts (or equivalently, over cosmic history), we can test the consistency of the prevailing Big Bang model and search for any deviations from adiabatic expansion that might suggest new additions to our model. In this paper, the authors combine CMB data from the Planck mission and previously collected X-ray observations of galaxy clusters to obtain constraints on this adiabatic temperature change. Instead of measuring the CMB directly, the authors make use of the thermal Sunyaev-Zeldovich (tSZ) effect. This effect causes high energy electrons from the intracluster gas contained within a galaxy cluster to boost the energy of CMB photons through electron-photon scattering. The authors use Planck data to subtract the background CMB signal from the X-ray emission of the galaxy clusters to measure the boost in CMB photon energy induced by these clusters. These galaxy clusters have known redshifts, and this redshift data combined with CMB temperature measurements yield the history of CMB temperature changes over time. The aim of this study is to measure the CMB temperature evolution over time, but this is indirectly done by first measuring the tSZ effect of galaxy clusters at various redshifts. The authors measure the CMB temperature shifts caused by the tSZ effect by subtracting the CMB background, modeling the frequency-dependence of the tSZ effect, and and selecting the best fitting model to the cluster. This tSZ effect measurement then yields the CMB temperature at a certain redshift. The resulting temperature evolution measurements are consistent with the CMB temperature evolving adiabatically over time, and are consistent with previous attempts to quantify this adiabatic cooling. Fig. 1 plots the redshift evolution of the inferred CMB temperature (scaled with respect to redshift and the current CMB temperature). The shaded region and blue points represent the measurements done in this paper, and this is consistent with the hotizontal red line representing adiabatic evolution. Fig. 1: CMB temperature (normalized with respect to redshift and present-day CMB temperature) plotted against redshift. The blue square points and shaded regions correspond to the measurements performed in this paper, which are in good agreement with the horizontal red line representing adiabatic cooling. The black dots are previous measurements done by a previous study. While this agreement is perhaps not too surprising given the spectacularly good predictions made by the Big Bang model, this kind of consistency check is important for maintaining our confidence in the Big Bang model and ruling out other potential cosmologies. For further validation, the authors plan to continue this analysis by expanding their sample of galaxy clusters to higher redshifts for additional consistency checks. Hi Anson, I have a question regarding the thermal Sunyaev-Zeldovich effect. You described the effect as being propelled by high energy electrons that scatter with photons from the CMB. I am wondering how the electrons in these galaxy clusters come to have particularly high energy. Is it somehow related to the formation of the cluster? It’s amazing that something this subtle is possible in practice. Not only can we see the primary anisotropies in the CMB; we can apparently use secondary anisotropies and to constrain the temperature evolution of the universe. That’s really “cool” (forgive the pun). How did the previous study (the one whose results are shown in black in the figure) measure the CMB temperature? The error bars it gives look generally smaller than this study’s – is there a reason this study’s method is better, or are they just independent ways of confirming the results? I had a similar question: the error bars of this study seem to be particularly big, is there any reason why this is the case? Is there any way to probe further than the CMB? Or is modeling the only way to get (predicted) information from before that point? The data at the present seems to be limited to relatively low redshifts. Is it possible, presently or in the future, to include data for higher redshift galaxies to observe the agreement for a larger and wider dataset? 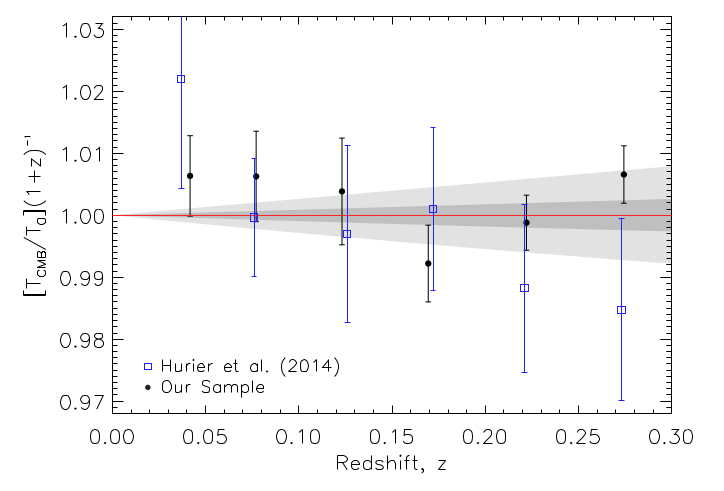 Although the error bars are large, the blue points in the last plot appear to be trending downwards with redshift. Were tests done to make sure this wasn’t an actual slope or is it possible there is a previously-unnoticed trend in this data? I agree with Jonathan, it appears that there is a downward trend with increasing redshift in that plot. Is that a result of the y-axis transformation? Also, 2 of the 6 error bars are not consistent with adiabatic cooling represented by the red horizontal line. With such a small sample size, it is hard to believe that we could prove anything conclusively. I believe much more should be done to prove this in terms of gathering more data points especially in closer and higher redshift, as the error bars to not seem to show a consistency with the adiabatic line. How well understood are these high energy emissions by these galaxies to model them in this way? When you refer to the Big Bang model are you including the inflation model? Or does the big bang model as you refer to it here not necessarily include inflation as a part of it? Does the fact that the temperature of the CMB was cooler affect the evolution of the Universe at all?